The Simon Kenton Memorial Bridge built in 1931. 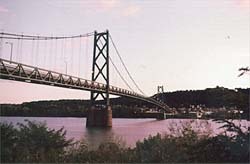 The bridge spans one mile across the Ohio River from Aberdeen, Ohio, to Maysville, Kentucky. It is named in honor of Simon Kenton, "founding father of Mason County." To reach Washington after crossing the Simon Kenton bridge, turn left as you exit the bridge and turn right onto US 68 at the second light go four miles. When you come to the light at Route #9, (the AA Highway), go straight on across it then turn left at the second light up into Washington. This old Buffalo Trail is marked with signs to Washington.